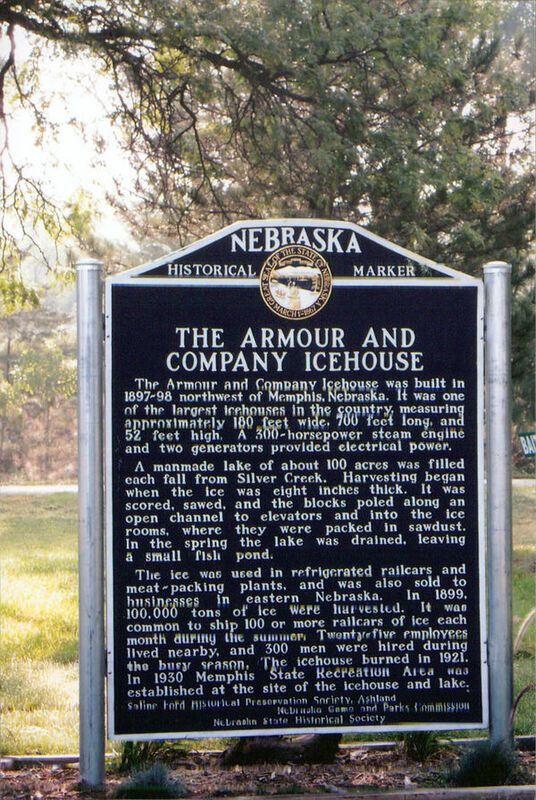 The Armour and Company Icehouse was built in 1897-98 northwest of Memphis, Nebraska. It was one of the largest icehouses in the country, measuring approximately 180 feet wide, 700 feet long, and 52 feet high. A 300-horsepower steam engine and two generators provided electrical power. A manmade lake of about 100 acres was filled each fall from Silver Creek. Harvesting began when the ice was eight inches thick. It was scored, sawed, and the blocks poled along an open channel to elevators and into the ice rooms, where they were packed in sawdust. In the spring the lake was drained, leaving a small fish pond. The ice was used in refrigerated railcars and meat-packing plants, and was also sold to businesses in eastern Nebraska. In 1899, 100,000 tons of ice were harvested. It was common to ship 100 or more railcars of ice each month during the summer. Twenty-five employees lived nearby, and 300 men were hired during the busy season. The icehouse burned in 1921. In 1930 Memphis State Recreation Area was established at the site of the icehouse and lake. This page was last modified on 12 September 2017, at 14:04.